When you can’t buy ready made snacks, these muffins really hit the spot. They taste amazing. The muffins are prepared first. After baking, they are allowed to cool slightly. Then the tops of the muffins are dipped in melted margarine. Finally they are rolled in powdered cinnamon sugar. They’re great for getting kids interested in cooking. Leftovers travel well in lunch boxes. First prepare the muffins. Get out a medium-sized mixing bowl. Measure into it the soymilk, vegetable oil, sugar, egg, salt and nutmeg or cinnamon. Use a wire whisk to beat the ingredients until they are smooth and a little creamy. Measure in the gluten-free flour and baking powder. Using your whisk again beat the mixture until mostly smooth. A few small lumps are fine. Drop the batter into well oiled muffin cups. Bake at 400° for about 25 minutes. The muffins will be nicely puffed and lightly browned on top. Remove the muffin from the oven. Dump the muffins out onto the counter to cool. While the muffins are cooling prepare the topping. This is the fun part. It’s a great time for the kids to take over. Melt the margarine in a small bowl or custard cup in the microwave. Or melt it in a small pan on the stove over low heat. In a cereal bowl combine the powdered sugar and cinnamon. Use a fork to mix well. After the muffins have cooled enough to handle, dip their tops into the margarine. Then roll the buttery top in the powdered sugar mixture. Set the muffin on a serving plate and go on to the next muffin. Continue until all of the muffin tops are coated in margarine and powdered sugar. 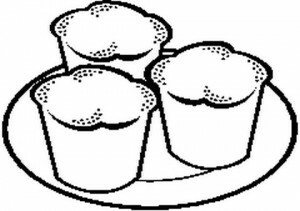 If there is any sugar leftover sprinkle it evenly over the muffins on the serving plate. Serve as an accompaniment to breakfast or as a tasty snack. Great in lunch boxes too. These are rich and buttery and very similar in texture to cake donuts. Per Serving: 228 Calories; 10g Fat (38.8% calories from fat); 2g Protein; 33g Carbohydrate; 1g Dietary Fiber; 18mg Cholesterol; 253mg Sodium. Exchanges: 1 Grain(Starch); 2 Fat; 1 Other Carbohydrates. I made these yesterday. They are very good! They do need the topping though. I ate one without the topping and it was so-so. With the topping, they are fantastic. I’ll be making these again. I would think they would freeze just fine for maybe up to 3 months. Some breads deteriorate more quickly in the freezer than others, so 3 months would be a good safe zone for testing. Double wrap them for best keeping. Good luck! Thank you for your help. Hope your family is doing ok with this crazy winter we have had. In Wisconsin it has been bitter cold and lots of snow. We have had the crazy weather too. Close to zero one week and up in the sixties a week later. Some plants budded early and then froze solid later. It has been an unpredictable winter. Our power was out for 16 hours after one heavy wet snow, but we made do with kerosene and propane. It was still uncomfortable. For the most part we’ve managed okay. Glad to hear that you have too!